Val Systems: Decline Effect in Linguisics? Joe, when I analyzed the Buckeye Corpus data you gave me, it showed that semi-irregular past tenses deleted MORE than monomorphemes, which I called "an unexpected result that deserves future investigation". But you're showing the usual ordering of the three categories. Any idea why the difference? I can't be completely certain, but I now have code you can clone under the repository TD-Classifier on my github. My phone won't let me paste the link here. Check it out and send me a pull request of anything looks like it needs fixed. My other question is: don't your charts show that the problem of overestimation is alleviated by a large enough sample size? This contradicts Gelman to some extent. 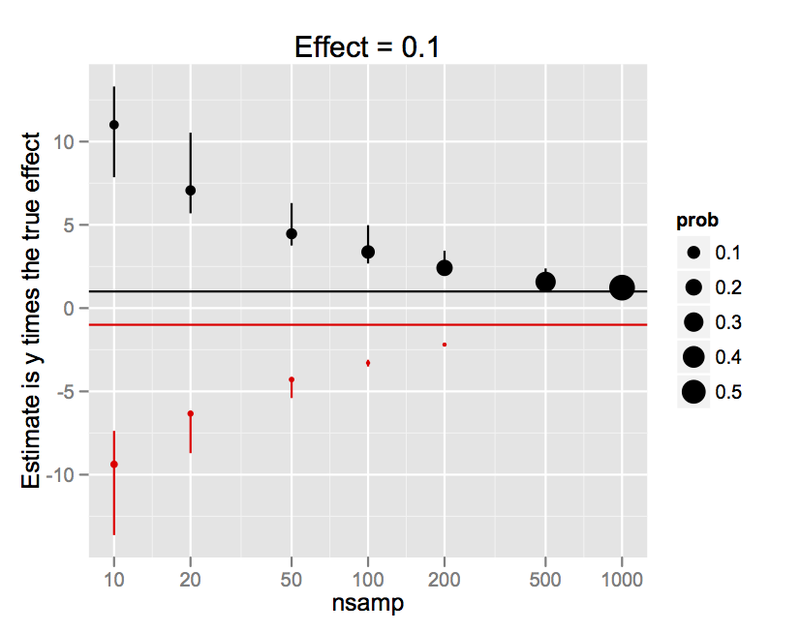 I think Gelman says that smaller samples are more likely to have worse Type M errors. His suggestion of doing retrospective power analyses suggests that underpowered studies are more likely to have Type M errors. My third question is, why not try to replicate Guy's results in White Philadelphia first - you're adding a major (potential) other variable when you compare them to global Englishes. It's on my to-do list! But given Guy's model, the dialect differences would have to do with fundamentally different morphological structures for the cases involved, which seems less likely than just there isn't the relationship there that Guy thought there was. I think that there are two major contributors to the decline effect in psychology that might not pose a problem to linguists. The first is the effect size-publishability issue. Often, experiments are constructed for a debate involving small effects. If you observe a p value of .07 after having run 20 subjects, you might consider running 5 more subjects to try to get a p value under .05. The only reason why one might do this is to use the "magic" word, 'significant,' in one's paper. As a phonetician, I have never constructed an experiment in this fashion. Though, it is not uncommon in psychology. The result of this is that it is entirely possible to get Type M errors and false positives. The second issue has to do with the observability of the phenomena. Empirical studies in linguistics are often mostly behavioral. We observe speakers doing something that we can clearly measure, e.g. not pronouncing a past tense morpheme, and want to know the conditions in which they do it. It may be that we construct the wrong context and observe no difference in behavior (or a very small one), but we are usually basing the design of our experiments on things already observed in the literature (even impressionistically). Despite this, most of what we are interested in is measurable. This contrasts starkly with work in cognitive psychology where we are interested in the effects of more abstract dimensions, like phonological neighborhood density. As such abstract dimensions only play a role in speech production/perception insofar as they are predicted within a particular psycholinguistic theory, they are more ephemeral than things like vowel formants. I suppose this is also a reason why I've always considered the methodologies in linguistics to be much more akin to those in ethology than psychology. I tried replying to this earlier, but I guess Disqus doesn't like comments from mobile phones. The python script crawls the actual Buckeye transcriptions. buckeCoder.R codes the morphological and phonological factors, and buckSubset.R takes a subset of the data. I think Gelman actually says that smaller sample sizes are more prone to Type M errors. His suggestion that we should do retrospective power analyses seems to point to the fact that underpowered studies are more likely to overestimate the effect size. It's on my to-do list! But, given Guy's explanatory model, the differences between dialects would have to be driven by fundamentally different morphological structures for the cases involved. Just FYI I have recently done exactly what you mention, adding subjects in search of a "significant" effect, in a syntactic acceptability experiment. I can see why it's a bad practice but it's not limited to psychology. Don't quite see why linguists wouldn't have the same pressures for a "significant" result - are our editors/referees that much more enlightened than those in psych? Sorry, a couple more questions about the exponential results! I know the data's not exactly the same, nor the exact statistical analysis, but you're going from irregulars being almost exactly spot on the exponential prediction in 2008 (j = 2.01 ), and monomorphemes being fairly close to the prediction (k = 2.88) to these drastically different results in 2012: j = 1.38, k = 1.93. Or am I confused? Agreed. Although another interpretation is that all the divergent results in other places challenges "Guy's explanatory model" - and perhaps even challenges the procedure "assume what's true in Philadelphia is true everywhere, until proven otherwise". Not a huge difference due to coding. Agreed. I guess I should have said that I think fundamentally different morphological structures in each dialect is less likely than the Exponential Model isn't true. I don't mean that the exponential account is actually likely to be true only in Philadelphia. I always thought the exponential thing was one of the best results in sociolinguistics, because of the way it ties quantitative variationism to phonological theory. But... since then, I've heard that it doesn't actually conform to any extant version of Lexical Phonology, and now it seems very shaky on the data side as well. Yes, but it gave us the great methodological gift of "multiplication." Guy 1991 was so right in 2008. The "size-publishability" issue is just as bad in linguistics as in psychology. Linguistic reviewers often complain about non-sig results to me. Conversely, they also get mad (as do many speakers) when I say that an effect is significant but so tiny as to be of no practical significance. Cf. the "QWERTY" debacle. I don't see the contrast in methodologies either. Non-pronunciation of past tense is in fact difficult to observe, and it's not even clear WHAT should be observed: should we code something as a deleted /t/ if the burst is inaudible but an ultrasound reveals a pronounced coronal gesture? (My short answer is that what is audible is what can be learned, so we should focus on that, though that ultrasound data might be of interest to understanding the underlying processes.) (TD) is more empheral than, say, response times. I don't think there's any valid generalization of the form "linguistic observables are more/less observable than cog. psych. observables". I'm not even sure what we're talking about. We're only talking about percent retention in three categories. What could affect this?1) coding of the categories2) what predictors are included in a regression model3) use of mixed model? Can't we use Guy's methodology to replicate Guy? Using Fruehwald 2012 methodology, even Guy 1991 doesn't come very close to 2 and 3. Well, my "methodology" for calculating j and k given Guy (1991) data is to just calculate j and k. Nothing too special about that. I don't know why no one has every reported the maximum likelihood exponents. One source of shrinking effects that I haven't seen mentioned explicitly in this discussion is simultaneous development in theory. That is, over time we might expect theory in a particular area to move from broad contrasts (and large effects) toward more subtle contrasts between variables that result in smaller effects. I'll give an example from a recent synthesis (Plonsky and Gass, 2011 in Language Learning). We looked at 174 studies in the interactionist tradition of second language acquisition from 1980-2009 and found the average d values for treatment-comparison contrasts to decline over the life of this line of research: 1980s = 1.62, 1990s = .82, 2000s = .52. Does nsamp refer to the number of "observations" within each of the two groups or the total number of "observations"? nsamp refers to the the number of observations within each group. So for nsamp = 10, there were 10 observations in each group, for a total of 20 observations. Did you know that Jonah Lehrer, the author of "The Truth Wears Off", has recently resigned in disgrace after being revealed as a fraud, plagiarist, and etc. ?